While the first half of the first season of Sailor Moon is available to buy today on Blu-Ray and DVD the first half of Sailor Moon R is now available in Japanese with English subtitles in digital download from Amazon Instant and Xbox Video. 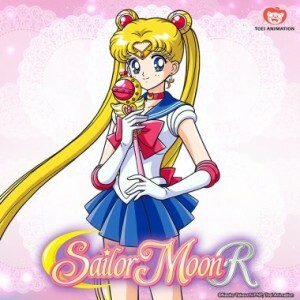 We previously only posted about the first half of season 1 being available digitally but while I wasn’t paying attention not only was the second half released, but now the first half of the second season, Sailor Moon R, is available as well. Some other distributers such as iTunes and the PlayStation Store only have the full first season available at this time. These episodes include the never before released Sailor Moon R episode 67, The Beach, the Island and a Vacation: The Guardians’ Break. This episode was never dubbed into English and, when ADV released their completely terrible “Uncut” Season 2 they very deceptively excluded this episode. They even split the season into two parts before and after this episode so that you needed to pay attention to notice that the set included episode 47 to 66 and then 68 to 89. 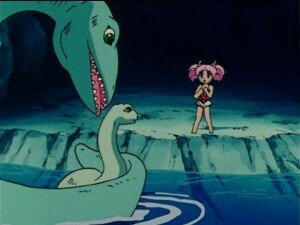 The episode is not terribly relevant to the rest of the season as it features Chibiusa getting upset at her friends due to a limited menu selection, getting lost at sea and befriending what appears to be a Plesiosaur which is impressive given the fact that they went extinct along with 3/4 of the Earth’s plants and animals some 65 million years ago. 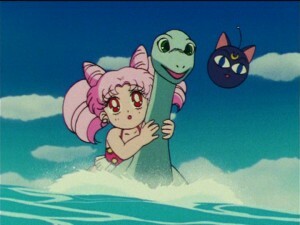 Chibiusa, who is herself living in the wrong time, doesn’t seem to be bothered by the appearance of a living dinosaur and calls it Kirin, which means giraffe, due to it’s long neck. The final episode in this chunk is episode 68 – Protect Chibi-Usa: Clash of the Ten Warriors. 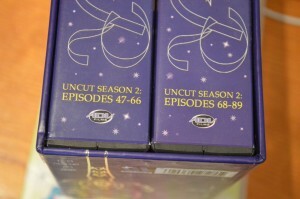 This covers 22 of the 44 episodes of Sailor Moon R, exactly half of the season. Not into paying for things and don’t hate ads? You can still watch the series for free on Hulu.